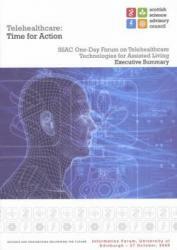 Scotland is well-placed to drive forward the telehealthcare sector, providing technologies and services to promote independence, health and well-being in our ageing and geographically dispersed population, according to a new report, Telehealthcare – Time for Action, published today by the independent Scottish Science Advisory Council (SSAC). The SSAC highlights the opportunities for business and industry to capitalise on the developing telehealthcare market, both nationally and internationally. Remote access to health services, sensors that detect when vulnerable people fall and personal alarms used by elderly people are all examples of telehealthcare – the use of information technology to provide health and care services at a distance. For Scotland to succeed in this area, the SSAC believes that the Scottish Government needs to articulate its vision and provide the leadership required to turn the research capability into innovative products and services which will meet local and international demands.